154 pages | 45 Color Illus. This book focuses on advances made in both materials science and scaffold development techniques, paying close attention to the latest and state-of-the-art research. Chapters delve into a sweeping variety of specific materials categories, from composite materials to bioactive ceramics, exploring how these materials are specifically designed for regenerative engineering applications. Also included are unique chapters on biologically-derived scaffolding, along with 3D printing technology for regenerative engineering. Covers the latest developments in advanced materials for regenerative engineering and medicine. Each chapter is written by world class researchers in various aspects of this medical technology. Provides unique coverage of biologically derived scaffolding. 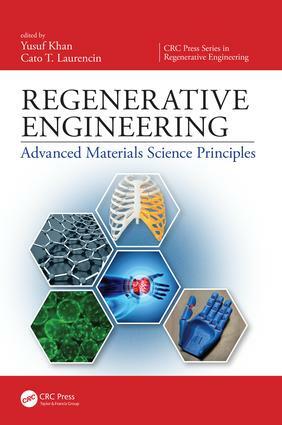 Includes separate chapter on how 3D printing technology is related to regenerative engineering. Includes extensive references at the end of each chapter to enhance further study. Yusuf Khan is an Assistant Professor in both Departments of Biomedical Engineering and Chemical Engineering at the University of Conneticut. He is also an Assistant Professor within the Department of Surgery at the University of Connecticut Health Sciences Center. Dr. Khan was one of the fouding members of the Institute for Regenerative Engineering at the Center. His primary research is in biological materials related to organ regeneration.